The missing link with Series B is the 100 Pound note. I heard that the proposal was to have Granuaile on the B Series 100, but does Servicon or the Central Bank ever produce a 'pattern' design? Re: Series B 100 Pound, Granuaile design? You are correct about the design. A pattern was done by Servicon, but the Central Bank had not ordered a design for the note, so as far as I know no proper proofs were printed. 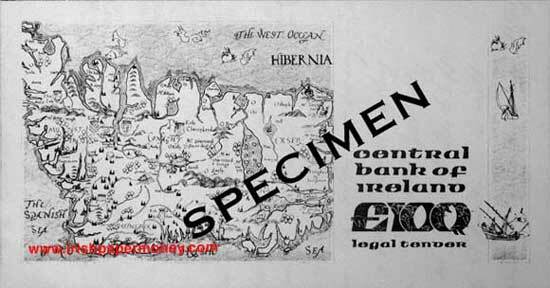 I was told back around 1994 that the Central Bank does not have any copies of the design. Pre=production designs do exist—I seem to remember seeing a picture of one a long time ago, but it may have been the AIB £100 note of the day—but despite my best efforts, i have never been able to track one down. The note designs will turn up eventually, these things always do. It would not surprise me if you mistook the AIB/Provincial Bank note as being it, because to this day, they are more Irish in appearance than any other currency in the country, and were more Irish in design, tradition and style than even their Southern counterparts. With a bit of messing around, we can speculate on its appearance. First, all the series B notes featured a calligraphic background. Second, it would have a small face full length portrait. the Carolan 50 gives a clue. Third, the rear, maps and sailing ships. Colour. It will have to contrast to the 50 to avoid confusion. It won't be Red, likely Turquoise. I'll get a new laptop and spend a few hours working out the design. If anything it will be relaxing. Taking precedent (A Series, and Ploughman) that leaves Purple as the main unused colour, so I'd go for it as being the main colour of the £100. Actually, I'd suspect yellow as the colour, because the 10 pound is more purple than red. Yellow has not been used on any Irish notes, though, so this theory may be a tad unrealistic. I read on Wikipedia that it was to be in Mauve, with the Galtee mountains (A map) presumably, as the dominant rear element. Whatever it is, the mid 1980's recession rendered the need for a 100 Pound note redundant. Even 50's were relatively scarce until the series C note emerged in 1995, and with the economic boom years, the 50 became much more heavily used. I saw this statue. Immediately my brain 'flashed' - YES! This fits the design style of the Series B. Considering its going to be LARGE Red note measuring 188mm x 98mm, with a Turquoise Green underlay print as the secondary colour, I think this would be the dominant vignette, in the centre in the same vein as the Carolan 50. I have been waiting for a long time to see a picture of the B Series £100 note, as have we all. Here is a picture of the face and reverse of the first design mock-up of the Irish Series B £100 note, produced in 1979. The date is interesting, 10.9.79, a nod there from the designers to the first date of the A Series notes! This mock-up was submitted by Servicon to the Central Bank of Ireland in August 1979. 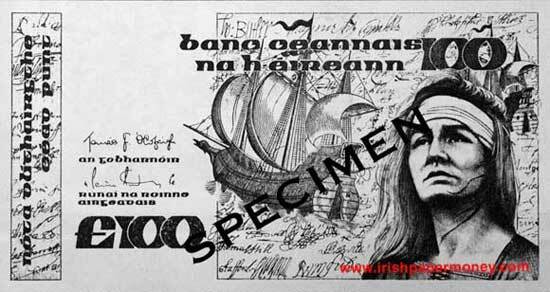 The so-called Siobhán McKenna note, which used the Irish actress as a model for the portrait. Note the old style numbering system, used on A Series notes. Whilst the overall design was broadly acceptable, the portrait design was rejected. The map of Ireland on the reverse is based on the earliest known example of a map of the island, dating from 1567. I had the notion that the note featured a map of Ireland on the reverse, must have read it somewhere way back in the 1980s. Of course, as time goes by, I began to doubt my recollection, especially as I couldn’t find any reverences to it in the meantime. Series B £100 note with Grace O’Malley, Grainuaile portrait. Images, courtesy of the Central Bank of Ireland Archives. That's an amazing find and great to see the design after so much speculation I like the overall appearance but agree that the portrait is somehow not quite right. It's a pity it did not make it to the final production stage. Here is a later design, with corrections, adjustments and a revised portrait. This is much closer to what the final note would have looked like in general appearance. Central Bank of Ireland 100 Pounds Series B. Images courtesy of the Central Bank of Ireland Archives. I've been waiting over 30 years to see this, and you guys were right - it would - eventually turn up. The gap between the numerals was opened up on later revisions, the CBI Governor of the day didn’t like it. The 1979 note was an early submission, a mock-up of the note, rather like a print out of a CAD drawing in today's terms. Lots of changes were made subsequently. Sill, the basic core design was there from the start. The second ship to the right was also to be removed in later versions. I’ve posted this to my Facebook. It’s caused a mild degree of interest, but ultimately - out of respect - I need to give respect to those who actually released it. Last edited by Vellakare on 08 Sep 2018 18:02, edited 1 time in total. High denomination notes are not popular in Ireland. Try paying for an item with a 200 euro note and I expect you will encounter a look of bewilderment ! On the £100 marked specimen above, the portrait although much improved looks too modern. In addition, the ship in the top right hand corner would be expected to obscure the serial number. It would be great to know more about the entire project. Mac, how about a book or documentary ? Hey. Great to see this! That is a super currency bill, especially the reverse. Sure is a shame they didn't make any. Hopefully more images will come to light in the near future, maybe even some proofs of the final version. I'm doing up a page for the web site currently, and there will be an article on the B Series £100 in the next issue of Coin News. We live in exciting (numismatic) times. My housemate Brendan Carey (Northern Irish from Warrenpoint has photoshopped this. This is what we get. Again, I’m likely to do a third and possibly more reworkings. Since we come along to 1986, and a discussion of size reductions for series C, that jumping from a £1 to £5 Banknote as the lowest denomination was highly regressive for the ordinary working class people in Ireland. Series C should have commenced in 1990, with the issue of a £2 note when the £1 coin was issued. The question is - who do you put on the £2? And who knows. Granuaille ends up on the £100 anyway - reworked into the series C design. Or do I put Granuaille on a £2 note, in the Seroes C style. In the dimensions I’ve considered using the ships as the secondary vignette. Put the Old version of Granuaille on the £2, the one from 1979.